A nine-member citizen Board of Trustees governs the library. The Leon-Saxeville Township Library is a joint library for the townships of Leon and Saxeville, and the board reflects this. Our trustees represent the townships, county and school district. The Library Board normally meets on the last Tuesday of each month, at 7:00 pm, at the Leon-Saxeville Township Library in Pine River, WI. These meetings are open to the public except as specified under Wisconsin law. Policy: Each member term runs three years, at the end of this term; they can accept a nomination for a second term appointment. Following the second term, a minimum of one year must lapse before any retired board member is available for future nominations. The library may be closed when severe weather or hazardous road conditions merit caution. Announcement of the closing of the library will be listed on the home page of the website and broadcasted on WAUH Radio, 102.3 The BUG. Excerpt taken from the Waushara Argus June 27, 1968. 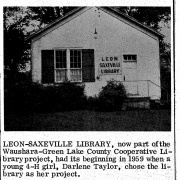 The Town of Leon Library was a project suggested a a 4-H Club Meeting on October 2, 1959. Mrs. Edwin Jewell was the leader of the club and Darlene Taylor, a club member, chose the library as her project. Books were donated by local residents and shelves were built in the town hall and the library was officially opened in June of 1960. A county library planning board was formed on April 2, 1961, with Mrs. Orville Booth as representative of the Pine River Library. 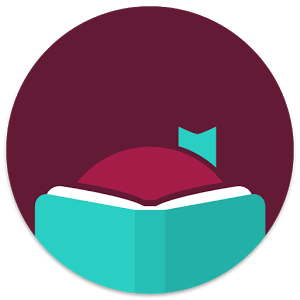 This county library board worked with the Wisconsin Free Library Service of Madison for a period of two years and the outgrowth of these meetings was the formation of the Waushara-Green Lake County Cooperative Library Project, with a control center in the Berlin Public Library. The local library became known as the Leon-Saxeville Township Library. This year's officers are Mrs. Edgar Frater, President; Mrs. La Verne Brooks, treasurer; Mrs. Alfred F.C. Schmidt, secretary; with the other members of the board being Mrs. Prosper Broadwell and Dr. R.O. Ebert. The librarians are volunteer.